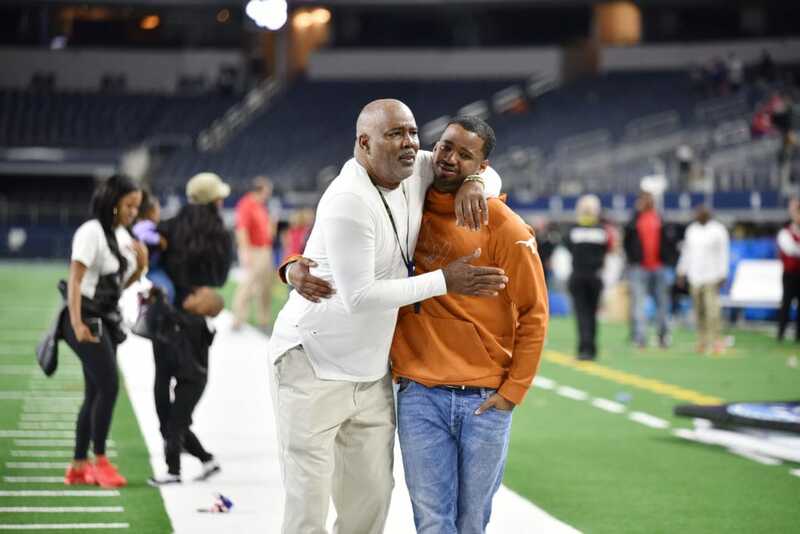 ARLINGTON—In a play that will probably be on the reel of every sports show for the next week Galena Park North Shore (16-0) snatched the state title out of the hands of Duncanville Coach Reginald Samples and his Panthers (14-1). Down 1 point, North Shore’s Dematrius Davis launched a 45 yard bomb to connect with AJ Carter in the far corner of the end zone. When the clock ran out the score was 41-36. Just one possession prior was another spectacular play. With 1:07 left in the game Duncanville reclaimed the lead 36-35. The two point conversion was no good. Panthers’ fans got a glimpse of the familiar powerhouse defense during the last minute in front of 42,363 screaming fans at AT&T Stadium. Coach Reginald Samples hoped to finally get the state title he has been diligently working towards for years. The third quarter left much to be desired. 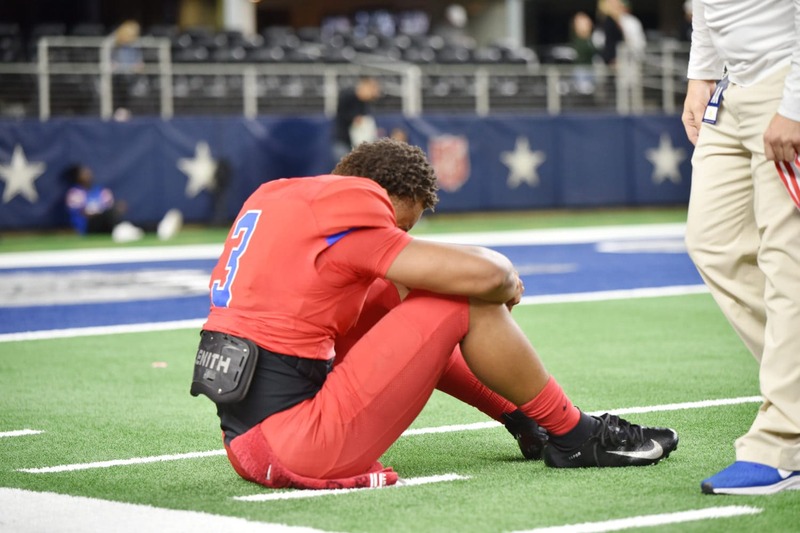 The Duncanville Panthers failed to capitalize on critical downs. At the same time the Mustangs failed to take advantage of these situations as well. A final push during the last possession of the third quarter set up a Duncanville Field Goal during the opening seconds in the final quarter. Despite being counted out by some sports analysts the Duncanville Panthers are made a valiant effort to answer every score or break out run that the Galena Park North Shore Mustangs. The first quarter was eventful as promised. At the half Galena Park North Shore lead in the 6A State Championship game 29-20. In the blink of an eye tonight’s game was off to a combustive start. 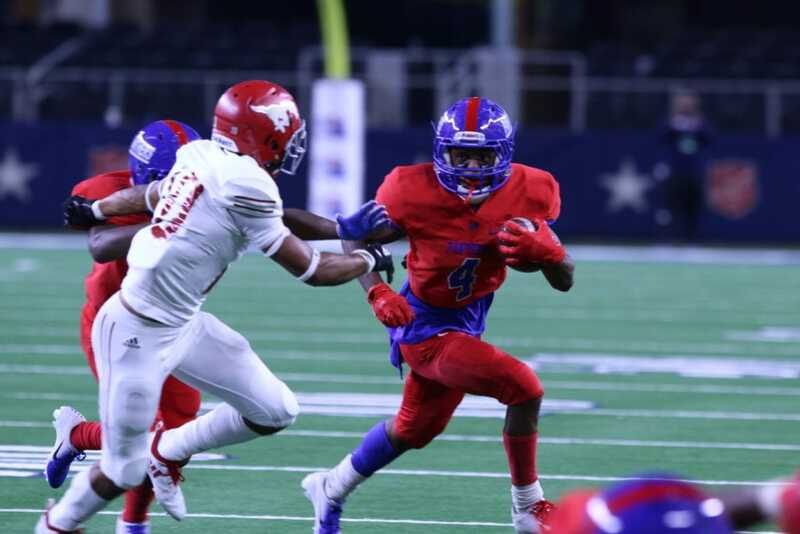 After the kickoff return, Duncanville returned to the scene of the crime in an effort to answer North Shore and dispel any naysayers. The hand off to Trysten Smith was stopped at the line of scrimmage for no gain. Next a pass attempt is broken up in the backfield and the Panthers were noticeably deflected after a season of shutting down teams by an average of 30 points. A 35 yard quarterback keeper by Ja’Quindon Jackson to the North Shore 45 yard line reinvigorates the Panthers offense. Five possessions later Victor Escalona kicks the 16 yard field goal to bring the score 7-3. North Shore offense retakes the field but after being stopped at their own 38 yard line they punt. At this point the Panthers go to work. Duncanville recovers the ball at the 18 yard line. Hand off to Tristan Smith who gains 2 yards. Another quarterback keeper to the NS 23 brings the Panthers back into the redzone. A handoff puts Running Back Trysten Smith in the end zone and brings Duncanville into the lead 10-7. The first 8 minutes of the second quarter were relatively quiet. With both teams scoreless in the with 7 minutes left in the quarter, dynamic plays by Ja’Quindon Jackson and Trysten Smith have placed the Panthers back in scoring position at the 19 yard line.